The purpose of a 1957 Buick engine tune-care is to restore power and performance that has been lost through wear, corrosion, or deterioration of one or more parts or units. In the normal operation of an engine these changes take place gradually at quite a number of points so that it is seldom advisable to attempt an improvement in performance by correction of one or two items only. Time will be saved and more lasting results will be assured by following a definite and thorough procedure of analysis and correction of all items affecting power and performance. The parts or units which affect power and performance may be divided, for analysis, into three groups in accordance with their function in producing (1) Compression (2) Ignition (3) Carburetion. The tune-care procedure should cover these groups in the order given. While the items affecting compression and ignition may be handled according to individual preference, correction of items in the carburetion group should not be attempted until all items in compression and ignition has been satisfactorily corrected. Insert rubber fitting of compression gauge into a spark plug port and hold gauge tightly in position. Push throttle wide open and crank engine until compression gauge reaches its highest reading, which should require only a few revolutions of 1957 Buick engine. Repeat this test on all cylinders, making sure to fully release pressure in gauge after each test. Make record of readings. The compression gauge hand should jump to about 75 pounds on the first compression stroke, with a few more strokes giving maximum pressure. If the pressure is built up in the gauge in jerky steps of 10 to 20 pounds at a time, it indicates leakage of pressure at some point such as head gasket, valves, or piston rings. Series 40 Synchromesh – 150 lbs./sq. in. Series 40 Dynaflow – 170 lbs./sq. in. Series 50-60-70 – 185lbs./sq. in. Engines newly broken in may have compression pressure considerably higher than shown above. Pressure variation between all cylinders should not exceed approximately 10 lbs./sq. in. Low compression pressure in two adjacent cylinders indicates a head gasket leak between the two cylinders. Clean, inspect, gap and install spark plugs (par. 10-42). Inspect battery and cables; fill battery to proper level (par. 10-15). Test cranking motor circuit if battery is in good condition but cranking speed is low (par. 10-34). Adjust fan belt (par. 2-21) and inspect generator (par. 10-23). If difficulty is experienced in keeping battery charged, test generator regulator (par. 10-26). Inspect entire ignition system and make indicated corrections (par. 10-40). Inspect and test fuel pump (par. 3-12). Replace gasoline filter, free up and lubricate manifold heat valve, clean and refill air cleaner (par. 3-7). Check operation of choke valve and setting of choke thermostat (par. 3-8). Check adjustment of fast idle cam and choke unloader (Carter par. 3-17; Stromberg par. 3-26). Check throttle linkage adjustment, also dash pot adjustment on Dynaflow car (par. 3-9). Inspect all water hose connections and tighten clamps. Road test car for power and overall performance. These subjects are covered in Section 3-B. See paragraph 3-4 for hard starting, paragraph 3-5 for improper engine performance, and paragraph 3-6 for excessive fuel consumption. If a 1957 Buick engine is reported to be using an excessive amount of oil, a thorough inspection should be made for external leaks and the conditions of operation should be carefully considered before assuming that the engine is using too much oil as a result of an internal condition. Place clean paper on the floor under engine and run the 1957 Buick engine at medium speed until the oil is thoroughly warmed up, then stop the 1957 Buick engine and check for oil leaks and dripping on the paper. Inspect both sides and front and rear ends of engine for wet spots. Pay particular attention to rocker arm cover, timing chain cover, and lower crankcase gaskets. All external leaks should be corrected and the results noted before attempting any internal correction. Improper reading of oil gauge rod. An erroneous reading will be obtained if car is not level, gauge rod is not pushed down against stop, or insufficient drain-back time (1 minute) is not allowed after stopping 1957 Buick engine. An over-supply of oil may be added if gauge rod markings are not understood. The space between the “FULL” and “ADD” marks represents 1 quart. Oil too light. The use of oil of lower viscosity than specified for prevailing temperatures will contribute to excessive oil consumption. Continuous high speed driving. In any automobile engine, increased oil consumption per mile may be expected at speeds above 60 MPH. High speed driving following slow speed town driving. When a car is used principally for slow speed town driving under conditions where considerable crankcase dilution occurs, a rapid lowering of oil level may occur when the car is driven for some distance at high speed. This is because the dilution from town driving is removed by the heat of the high speed driving. This is a normal condition and should not be mistaken for excessive consumption. Valve guides worn. Excessively worn valve guides may cause excessive oil consumption. Piston rings not worn in. A new engine, or an engine in which new rings have been installed, will require sufficient running to wear in the rings to provide proper seating against the cylinder walls. During the wear-in period a higher than average oil consumption is to be expected, and no attempt should be made to improve oil economy by replacing rings before the 1957 Buick engine has been in service for at least 3000 miles. Checking Noise Level of Valve Mechanism The noise level of the valve mechanism cannot be properly judged when the 1957 Buick engine is below operating temperature, when hood is raised, or when rocker arm covers are removed. At approximately 500 RPM to 1200 RPM, particularly when engine is cold, the valve mechanism has a normal operating noise which is audible with the hood raised, and still more audible when rocker arm covers are removed. Before attempting to judge valve noise level, loosen radiator cap and run engine at 1200 RPM to 1500 RPM for 20 minutes, which will stabilize oil and water temperatures and bring 1957 Buick engine parts to a normal state of expansion. The hydraulic valve lifters will be free of air and filled with oil. When new or reconditioned hydraulic lifters have just been installed it is very important to run the engine until lifters are properly filled with oil. When 1957 Buick engine is at operating temperature close the hood and listen for valve noise while sitting in the driver’s seat. Run 1957 Buick engine at idle speed, then at various higher speeds. The noise level of the valve mechanism should be very low as observed from the driver’s seat. It is advisable to observe the valve noise level in a number of engines that have been properly broken in, in order to develop good judgment for checking the noise level in any given engine. If the preceding check indicates that the valve mechanism is abnormally noisy, remove the rocker arm covers so that the various conditions which cause noise may be checked. A piece of heater hose of convenient length may be used to pick out the particular valves or valve linkages that are causing abnormal noise. With the 1957 Buick engine running at a speed where the noise is pronounced, hold one end of hose to an ear and hold other end about 1/2″ from the point of contact between each rocker arm and valve stem. Mark or record location of the noisy valves for investigation of the following causes. Excessive Oil in Crankcase. A crankcase oil level high enough to permit the crankshaft to churn the oil will cause air bubbles in the lubricating system. Air bubbles entering the hydraulic valve lifters will cause erratic operation resulting in excessive lash clearance in valve linkage. Find and correct cause of high oil level, adjust oil to proper level (par. 1-1), then run 1957 Buick engine long enough to expell all air from lubrication system and lifters. Sticking, Warped, or Eccentric Valves, Worn Guides. Sticking valves will cause irregular engine operation or missing on a low-speed pull, and will usually cause intermittent noise. Pour penetrating oil over the valve spring cap and allow it to drain down the valve stem. Apply pressure to one side of valve spring and then to opposite side, and then rotate valve spring about 1/2 turn. If these operations affect the valve noise it may be assumed that valves should be reconditioned (par. 2-14). Worn or Scored Parts in Valve Train. Inspect rocker arms, ball studs, push rod ends, push rods for bends, valve lifters, and camshaft for worn or scored wearing surfaces. Replace faulty parts. Valves and Seats Cut Down Excessively. Noisy and improper valve lifter operation may result if a valve and its seat have been refinished enough to raise the end of the valve stem approximately .075″ above normal position. In this case it will be necessary to grind off end of valve stem or replace parts. Faulty Hydraulic Valve Lifters. If the preceeding suggestions do not reveal the cause of noisy valve action, check operation of the hydraulic valve lifters as described in subparagraph c.
When checking 1957 Buick hydraulic valve lifters, remember that grit, sludge, varnish or other foreign matter will seriously affect operation of these lifters. If any of these foreign substances are found in the lifters or anywhere in the 1957 Buick engine where they may be circulated by the lubrication system, a thorough cleaning job must be done to avoid a repetition of valve lifter trouble. To guard against entrance of grit into the lifters the engine oil must be changed as recommended in paragraph 1-6 and the oil filter element must be changed as recommended in paragraph 1-2. The 1957 Buick engine oil must be the heavy duty type (par. 1-6) to avoid detrimental formation of sludge and varnish. The car owner should be specifically advised of these requirements when the car is delivered. Faulty valve lifter operation usually appears under one of the following conditions. Rapping Noise Only When Engine is Started. When 1957 Buick engine is stopped any lifter that is on a camshaft lobe is under pressure of the valve springs; therefore leak-down or escape of oil from lifter lower chamber occurs. When the 1957 Buick engine is started a few seconds may be required to fill the lifter, particularly in cold weather when oil is sluggish. If noise occurs from this cause only occasionally it may be considered normal and requiring no correction. If noise occurs almost daily, however, check for: (a) Oil too heavy for prevailing temperatures (par. 1-6); (b) Excessive varnish in lifter. Intermittent Rapping Noise. An intermittent rapping noise that appears and disappears every few seconds indicates leakage at check ball seat due to foreign particles, varnish, or defective surface of check ball or seat. Recondition noisy lifters (par. 2-15) checking carefully for presence of grit or metal particles, which would require a thorough cleaning to remove source of such material. Noise on Idle and Low Speed. If one or more valve lifters are noisy on idle and up to approximately 25 MPH but quiet at higher speeds, it indicates excessive leakdown rate or faulty check ball seat on plunger. With 1957 Buick engine idling, lifters with excessively fast leakdown may be spotted by pressing down on each rocker arm above the push rod with equal pressure. Recondition noisy lifters (par. 2-15). Generally Noisy at All Speeds. Check for high oil level in crankcase. See subparagraph b (1) above. With 1957 Buick engine idling, strike each rocker arm above push rod several sharp blows with rawhide hammer; if noise disappears it indicates that foreign material was keeping check ball from seating. Stop engine and place lifters on camshaft base circle. If there is lash clearance in any valve linkage it indicates a stuck lifter plunger, worn lifter body lower end, or worn camshaft lobe. Recondition noisy lifter (par. 2-15). Loud Noise at Normal Operating Temperature Only. If a lifter develops a loud noise when 1957 Buick engine is at normal operating temperature but is quiet when engine is below normal temperature it indicates an excessively fast leakdown rate or score marks on lifter plunger. Recondition lifter (par. 2-15). If unusual vibration or noise develops in the operation of a car, test first to determine whether the condition originates in the 1957 Buick engine or in other operating units. Time will often be saved by checking the recent history of the car to find out whether the vibration or noise developed gradually or became noticeable following an accident or installation of repair parts. Vibration or noise is usually most pronounced when driving at a certain speed. If the 1957 Buick engine is run at the equivalent or critical speed with car standing and transmission in neutral, the condition will still exist if the 1957 Buick engine, clutch, or transmission is at fault. If the condition does not exist with engine running and car standing still refer to Rear Axle Trouble Diagnosis (Section 6-3) and Chassis Suspension Trouble Diagnosis (Section 7-B). If vibration or noise exists with 1957 Buick engine running and car standing still, the following items should be investigated and corrected as required. An 1957 Buick engine which is not properly tuned will run rough and vibrate, particularly at idling and low speeds. 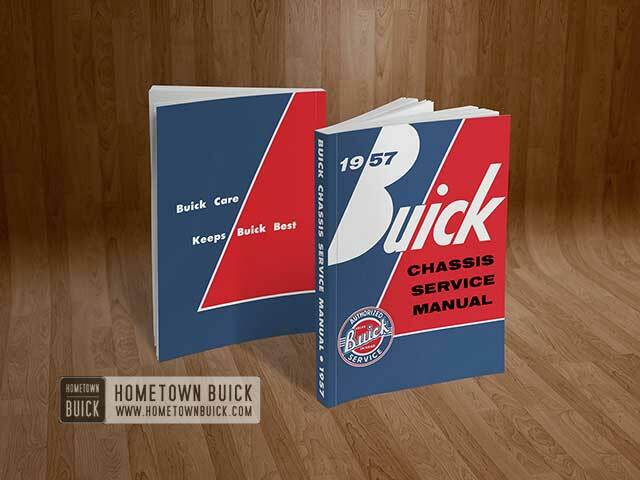 A thorough 1957 Buick engine tune up operation is the proper correction (par. 2-9). Bent fan blades will cause vibration and noise. Fan blades may be bent by accident or by the objectionable practice of turning the 1957 Buick engine by means of the blades. Remove fan belt and run 1957 Buick engine. If vibration or noise is eliminated or reduced it indicates that the condition is caused by the fan, generator, belt, or possibly the water pump. Check water pump for rough or noisy bearing and replace parts if necessary. Inspect fan belt, all pulleys, balancer, fan blades, and generator for undercoating or other material that would cause an unbalanced condition. Examine fan belt for abnormally thick or thin sections. Check fan blades for excessive runout and correct if necessary. Check all pulleys for abnormal runout or wobble and replace if necessary. Reinstall fan belt and adjust to proper tension (fig. 2-37). With 1957 Buick engine running, place one hand on generator and slowly open throttle from idle to approximately 60 MPH. If generator vibrates enough to create a noise in the engine or car it will vibrate enough to be felt by the hand. As the engine is slowly speeded up the generator might be felt to go into periods of vibration at different engine speeds. Noise caused by the generator should occur at the same time that generator vibration occurs. Repair or replace a noisy generator. If the generator is causing a moan or whine it will increase in intensity when car lights are turned on. Replacement of generator is the only remedy for this condition. Vibration may be caused by broken or deteriorated 1957 Buick engine mountings, or by mountings that are loose or improperly adjusted. Adjust and tighten loose mountings (par. 2-25) or replace faulty mountings. Loose or broken rivets in the crankshaft balancer may cause vibration in the 1957 Buick engine. If the balancer is damaged by accident in such manner that the parts cannot function freely, extreme roughness will be produced which may eventually cause breakage of the crankshaft if it is not corrected. A balancer which shows external evidence of damage or which is suspected of being inoperative should be replaced and the result checked, since it is not possible to test the balancer in any other way. Vibration will result if connecting rods or pistons are installed which are not of equal weight with all other rods or pistons in 1957 Buick engine. If new parts have recently been instal1ed, these should be checked to determine whether they are standard Buick parts or have been altered in weight by filing, machining, or other repairs. 1957 Buick engine roughness may be caused by an unbalanced combination of clutch, flywheel, and crankshaft even though these units are balanced individually during manufacture. This may occur if clutch or flywheel is removed without marking them so that they are reinstalled in original position, or if new parts are installed. An unbalanced condition of clutch, flywheel and crankshaft may be corrected as described in paragraph 2-27. Vibration existing with Dynaflow Drive may be due to unbalanced flywheel or the converter pump. Procedure for balancing these parts is given in paragraph 2-27. If the radiator is filled too ful1 when cold, expansion when hot will overfill the radiator and coolant will be lost through the overflow pipe. Adding unnecessary water will weaken the antifreeze solution and raise the temperature at which freezing may occur. To avoid losses from this .cause never fill radiator above the level line stamped 1 1/4” below the top of the head tank. The use of alcohol anti-freeze with a high temperature radiator thermostat will cause boiling and loss of coolant through the overflow pipe. If the cooling system requires frequent addition of water in order to maintain the proper level in the radiator, check all units and connections in the cooling system for evidence of leakage. Inspection should be made with cooling system cold because small leaks which may show dampness or dripping when cold can easily escape detection when the 1957 Buick engine is hot, due to the rapid evaporation of the leakage. Tell-tale stains of grayish white or rusty color, or dye stains from anti-freeze, at joints in cooling system are almost always sure signs of small leaks even though there appears to be no dampness. Air or gas entrained in the cooling system may raise the level in radiator and cause loss of coolant through the overflow pipe. Air may be drawn into the cooling system through leakage at the water pump seal. Gas may be forced into the cooling system through leakage at the cylinder head gasket even though the leakage is not sufficient to allow water to enter the combustion chamber. The following quick check for air leaks on suction side of pump or gas leakage from engine may be made with a piece of rubber tubing and a glass bottle containing water. With cooling system cold, add water to bring coolant to level line stamped in radiator head tank. Block open the radiator cap pressure valve, or use a plain cap, and be sure radiator cap is on tight. Attach a suitable length of rubber hose to lower end of overflow pipe. Run 1957 Buick engine in neutral at a safe high speed until the temperature gauge stops rising and remains stationary; in other words, until the engine reaches a constant operating temperature. Without changing engine speed, put the free end of rubber hose into a bottle of water, avoiding kinks or low bends that might block the flow of air. Watch for air bubbles in water bottle. A continuous flow of bubbles indicates that air is being sucked into the cooling system, or exhaust gas is leaking into the cooling system past the cylinder head gasket. It must be remembered that the Buick pressure system operates at higher temperatures than systems operating at atmospheric pressure. Depending on the pressure in cooling system, the temperature of water or permanent type anti-freeze may go considerably above 212°F without danger of boiling. Excessive water loss. (subpar. b, above). Slipping or broken fan belt (par. 2-21). Radiator thermostat stuck (par. 2-22), radiator air passages clogged, restriction in radiator core, hoses, or water jacket passages. Improper ignition timing (par. 10-41). Improper carburetor adjustment (par. 3-8). Exhaust manifold valve stuck (par. 3-7). Shortage of engine oil or improper lubrication due to internal conditions.